Just one last one left A Green Christmas Stocking finished in green satin with snow white top cuff and silver braided edge. This Christmas Stocking is made with shiny green satin on the front and green felt on the back. It is lined inside the front and also has a hanging loop at the top. This Christmas Stocking is made with shiny green satin on the front and green felt on the back. It is lined inside the front and also has a hanging loop at the top. This is a festive green Christmas stocking. 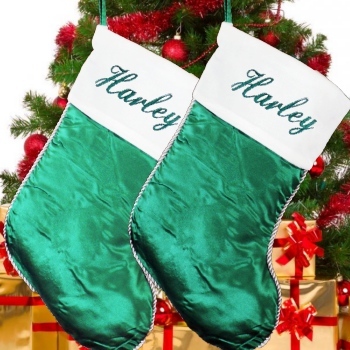 Personalised with an embroidered name or initials in green thread, make this stocking a special Christmas ornament.